The holy Lord must be great. He is male, he exists, he loves football, coal, oil, gold, money and Trump, he doesn’t care about a warming climate and the greenhouse effect and he couldn’t care less about all those billions of small murderous weapons around the world who make disenfranchised people in the poorer regions, neighborhoods and countries of our ailing planet kill each other. The holy Lord appreciates the ongoing violence in our entertainment TV as an integral part of our inhuman nature, fists breaking bones, gun bullets crushing skulls and other part of our soft human bodies, knives, fury, rash, death, blood and action and – yes, oh my God – the Lord loves Putin, his representative on Earth, who gets richer and richer in his corrupted, backward country, who proudly keeps mother Russia in more or less the same miserable state of mind it used to be throughout the centuries of pre-communism, communism and post-communism. Would it not be for the oligarch’s brutal exploitation of the rich resources in Russia’s soils, this country’s GNP would be a pretty pour one. Putin might not be the most sophisticated leader when it comes to reforming his country’s economy, but his instinct for power-play is unbeaten. As is written, the holy Lord divided the Red Sea, so the children of Israel may cross it and then the Lord made the floods come back and drown the Pharao and his soldiers. Likewise, Putin functioned as the saviour of Assad, when it looked as if Assad would lose the war against his people. Possessed and rightfully driven by his Machiavellian spirit, Putin seized the moment and crashed the Western world in 2015 in the very moment he sensed that Obama cares much more about Obama-care than about the safety of the world. He made Assad great again by assisting him with the Russian air force to continue to mass murder his people. More than six million Syrians were forced to flee their country, five million settled in neighboring countries and North Africa. The other million of Syrians found shelter in Europe, where right-wing populism abused these innocent people’s fate to stir nationalism and xenophobia and helped to bring Putin imitators on the continent into power. Putin’s young, bright hackers and the American invention of an uncensored uncontrolled Facebook helped Trump win the presidency and start the Trump era. In the here and now, while reading these lines and having watched those exciting world cup soccer games in HD on our huge flat screens, Assad and his little Godly Russian helpers finished another offensive to finally reestablish their reign all over Syria, about hundred years after the end of World War One, when Sykes and Picot, two gentlemen representing the victorious British and French empires were putting together this complicated merger of ethnic groups called Syria. In his email to his desolate, humanitarian-minded followers, Hassan from the „TheSyriaCampaign“ lamented as follows: „Since Russia started hosting the world’s biggest sports event, it has bombed hospitals in Daraa and its support to the Assad regime has displaced more than 270,000 people in Southern Syria. I want people to see this contradiction – at a time when Russia is occupying Syria and committing war crimes against my people, it should not be celebrated. But we won’t let them take away our love of football“. And then, on the fourth of July, the very Independence Day, when America celebrates the freedom from the suppression of the British Empire, it gained 242 years ago, we see a picture of this guy, Adnan Mohammed, looking into our eyes with his eyes, followed by this post. That’s it. We are not cynical anymore, we are sad and helpless, thinking about perished Adnan and the amputated arm of his little daughter. Sad and helpless readers might not return to our website, and aren’t we in dire need of a rising user-frequency so that potential donors might see a reason to support us? We continue to scroll down on the Facebook site of The Syria Campaign and get confronted with those young Syrian angry, veiled and cloaked mothers asking world public to do something. 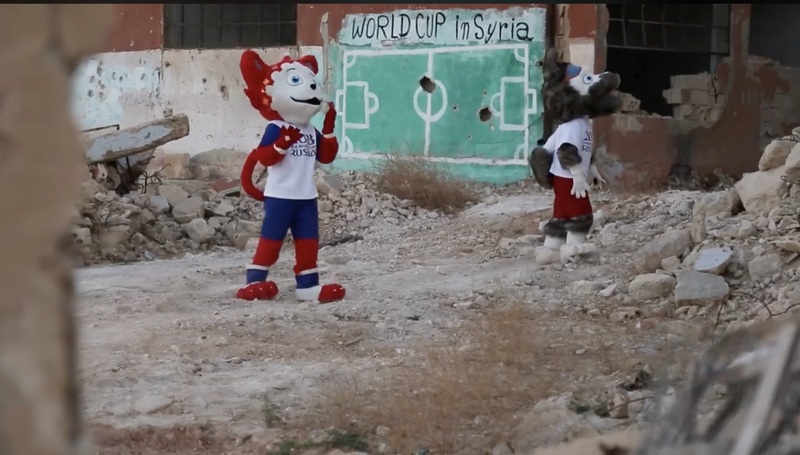 And now, as we have hit rock bottom, paralysed and powerless, this world cup promo clip made by Syrian activists comes up, showing Zabivaka, Russia’s 2018 official mascot, an upright walking human comic-cat, this time kicking the ball into the direction of the goal of a soccer field in the ruins of Aleppo, and then we see a number of one-legged Syrian boys on crutches playing football; all this finished up by collapsing, bombed down buildings in a cloud of dusk. The government of Uganda has recently introduced a social media tax in what it says are new avenue for raising revenues and silencing online gossiping. In a recent attack, Sikh candidate Rawail Singh was killed, leaving the future of his minority society at risk as Afghans prepare for October elections.